Bed and breakfast in Ashbourne. Described as "Gateway to Dovedale", Ashbourne is a busy market town centred around a cobbled market place. The streets of Ashbourne are lined with pleasant Goergian houses, now mostly converted into shops, the most attractive being Church Street with its antique shops. Inside St. Oswald' church you will find one of the most touching monuments to be seen in any church. The white Carrara marble effigy is of Penelope Boothby, who died aged 6 in 1793 and the inscription reads; "She was in form and intellect most exquisite, the unfortunate Parents ventured their all on this frail Bark, and the wreck was total". Also see Ashbourne & Ashbourne attractions. If you are in the right town but cannot find the accommodation you want on this page, you might consider Ashbourne hotels & self catering accommodation in Ashbourne. Location: approx 3 miles from Ashbourne. Set in the beautiful Dovedale Valley, The Izaak Walton is a 17th-century hotel with spectacular views across the Derbyshire Peaks, providing a perfect base to explore the Peak District. Awarded 2 AA food rosettes, Haddon Restaurant provides an elegant setting to dine in, with excellent cuisine. Guests may enjoy a drink in one of the cosy lounges, complete with log fires and beamed ceilings. The Izaak Walton Hotel is 10 minutes away from the historic market town of Ashbourne. With idyllic views of the River Dove, the famous Dovedale Stepping Stones are a short walk away. The hotel also has private fishing available on the river Dove. Alton Towers Theme Park is 20 minutes drive away. Many rooms have stunning views of the Dovedale Valley or the hotel gardens. The spacious rooms all have an en suite bathroom with shower, Wi-Fi internet access and satellite TV. In Ashbourne, Station Hotel has free Wi-Fi and free ample parking, 15 minutes' from Alton Towers. The town centre and bus station are a 2-minute walk away. An impressive mock-Tudor building, Station Hotel offers rooms featuring flat-screen digital TVs with Freeview channels. Full of character, some rooms have four-poster beds. On the edge of the Peak District, Station Hotel has a bar and restaurant, with a menu of local produce (advance booking recommended). The staff at Station Hotel are friendly and helpful. An excellent breakfast is provided. The town features shops, cafes, cobbled streets, and a market on the Old Square twice a week. For cyclist and walkers, the hotel is ideally situated for the Tissington Trail. Location: on the outskirts of Ashbourne. Near the Peak District National Park, Callow Hall is a Victorian country house hotel with a 2 AA Rosette-awarded restaurant. The market town of Ashbourne is nearby. 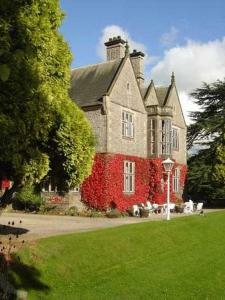 Surrounded by 44 acres of private garden and woodland, Callow Hall has rooms with flat-screen satellite TVs. Some rooms have countryside views. Callow Hall's award-winning restaurant serves modern European cuisine. There is also a bar and a traditional lounge area. Bed and breakfast near Ashbourne. Location: About 5 miles south of Ashbourne. En-suite with Tea/Coffee, T.V. Disabled access. Bed and breakfast in Ashbourne. Location: In the centre of Ashbourne. Double/family rooms, all facilities, private parking. children most welcome. close to alton towers. Bed and breakfast in Ashbourne. Location: In the centre of Ashbourne. 17thC Coaching Inn , 18 Rooms all en-suite, tea/coffee making T.V. Bridal Suite available. Bed and breakfast in Ashbourne. Location: In the centre of Ashbourne. We are a small family run guesthouse, with an accent on good food and quality accommodation. Formally 3 terraced cottages now converted into 1 individual house. Bed and breakfast near Ashbourne. Location: In the centre of Ashbourne. Large Victorian House, T.V, Tea/Coffee making, parking. Bed and breakfast in Ashbourne. Location: In the centre of Ashbourne. Situated in a quiet location near to town. Our rooms are very special, each in its own way. Bed and breakfast near Ashbourne. Situated on the outskirts of Ashbourne. 300 year old Cottage, in lovely village. Bed and breakfast near Ashbourne. Location: About 3 miles north of Ashbourne. King - sized beds, 4 poster beds, super - king bed. Bed and breakfast near Ashbourne. Location: About 4 miles north of Ashbourne. En-suite rooms, T.V, Tea/coffee making facilities, £21 per person. Bed and breakfast near Ashbourne. Location: About 3 miles north of Ashbourne. Near AltonTowers,T.V, Tea/Coffee making. . Bed and breakfast near Ashbourne. Location: About 3 miles east of Ashbourne. En-suite, T.V, 4 poster, Tea/Coffee, Grade II listed farmhouse.. Bed and breakfast near Ashbourne. Location: About 6 miles north of Ashbourne. Traditional farmhouse accommodation. Bed and breakfast near Ashbourne. Location: About e miles east of Ashbourne. Small Farmhouse Bed and Breakfast (1en suite, 1 private bathroom).